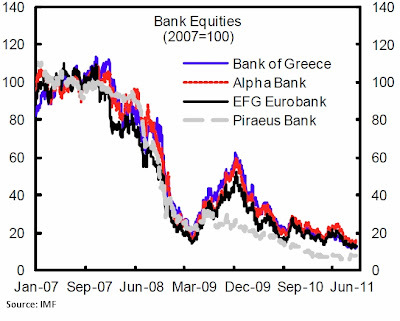 In the latest stress test conducted by the European Banking Authority, all Greek banks passed the critical threshold of 5% in Core Tier 1 capital versus risk-weighted assets – provided one includes “additional mitigating measures taken or planned” and “generic provisions already accumulated to cover future losses.” But the challenges facing the Greek banking industry have not gone away (see here); in fact, weakness in the banking sector was one of the main reasons that Greece needed to secure additional official financing earlier than 2012 (here). ECB Funding. After Greece received a bailout in May 2010, Greek banks have stopped relying more on the European Central Bank. December 2010 formed a peak when ECB funding reached €97 bn; it then fell by ~12% to €87 bn. Yet May 2011 shows a reversal with the gains made over the past four months disappearing. Even so, these estimates refer to the liabilities of the banking sector to the Bank of Greece, which is a proxy for ECB funding. As the IMF notes, “Recent ratings downgrades have also led to a decrease of value on Greek collateral by the ECB, necessitating banks to post additional collateral.” So it could be that the addition refers to a change in requirements rather than a change in underlying needs. Deposit Withdrawals. Deposits peaked in December 2009 and have since seen a steady decline. 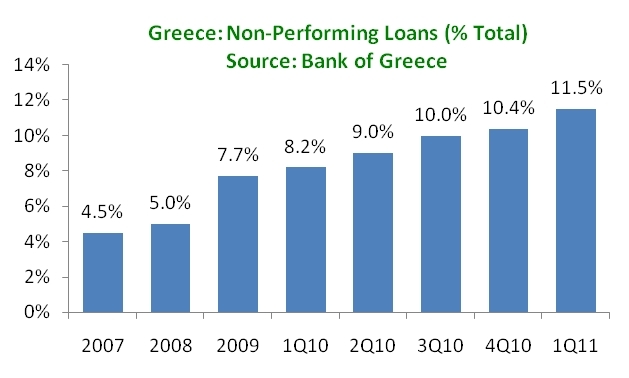 This is one of the most persistent trends in the Greek banking sector over the past 18 months, despite an apparent hiatus during Q4 2010. Relative to its December 2009 maximum, deposits have shrunk by 19% or €46 bn. Almost 60% of the decline has come from households. Non-Performing Loans (NPLs). The Bank of Greece has not published detailed NPLs numbers for 2011 yet; but the IMF notes that Q1 NPLs were 11.5% of the total. This marks a continued deterioration in the loan portfolio – even relative to the end of 2010 when the number was 10.4%. So far, there no detailed breakdown on where the NPLs are coming from, but data to end 2010 showed that the deterioration came from all loans: consumer, housing and business. Inability to grow credit. Credit was expanding rapidly until 2008; then private sector credit grew modestly in 2009, and then not at all in 2010. In early 2011, credit growth has actually turned negative: financing to the private sector has declined by an average 0.5% every month in 2011. The decline is driven by the household sector (housing and consumer loans), while credit to companies keeps growing modestly. Weaker returns. Since 2009, Greek banks have, on average, posted negative returns on assets and negative returns on equity (after taxes). Meanwhile, equities continue their free-fall, having lost more than 80% of their value relative to 2007. None of this includes exposure to Greek sovereign debt with credit institutions holding around €60 bn of Greece’s €355 bn debt. A series of privatizations, mergers and capital infusions will be needed to revitalize Greece’s banking sector. As I noted in the past, extra financing for the Financial Stability Fund (SFS) was a key driver for Greece’s higher than expected financing needs; not only does the latest program assume money spent on bank assistance, but it also assumes that “government recovering the resulting equity investment by 2014–15.” Failure to restore health in the banking sector will further deteriorate Greece’s chances to a sustainable debt path. 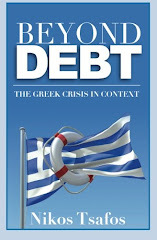 I think it is because of the economic setup of Greece. A lot of their people are very traditional where they rather keep their money in their dwelling. In the commerce side, there are no heavy industry or agriculture to do commercial banking. Negotiations between the Greek gov & creditors on a bond swap deal needed to avoid default appeared close to collapse with representatives of private bondholders saying they had been "paused for reflection." The bond swap aims to reduce Greece's debt by €100B ($128B) & is a key part of a 2nd, €130B ($166B) bailout. Without it, the country could suffer a catastrophic bankruptcy that would send shockwaves thru the global economy. If anything goes down, it has nothing to go to but up. Let's just wait till it regain its power again and bring back the economy. What we can is be positive. The current breakdown of the Greek economy has forced a lot of its citizens to put up their homes for sale just to stay afloat. People should also watch out after the recovery period if the current laws and debt will be abolished. Is Greece Fudging its Deficit Numbers?